The protozoan shown below is Actinosphaerium sp. This protozoan adjusted itself on the surface of a shell of a freshwater gastropod. 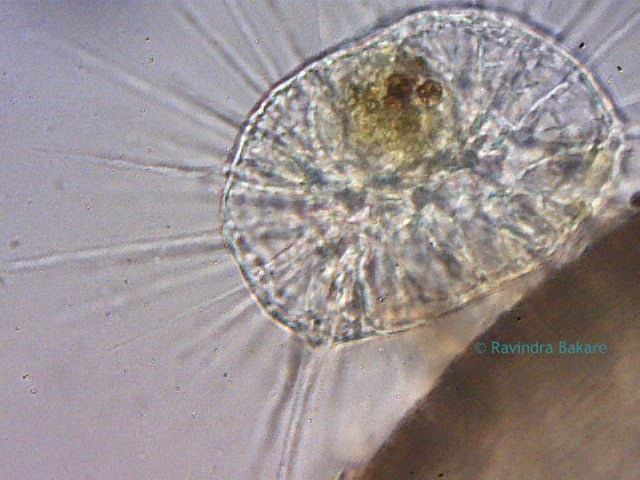 The Actinosphaerium sp. is a kind of Amoeba with a needle like pseudopodia used for catching food. Actinosphaerium sp. at 10x magnification. Image courtesy: Ravindra Bakare. Actinosphaerium sp. at 45x magnification. Image courtesy: Ravindra Bakare. Images were captured by Ravindra Bakare, Associate Professor of Zoology at Kisan Veer Mahavidyalaya in Wai Dist Satara, Maharashtra, India. Stagnant pond water was collected near the University and placed under a biological microscope. Bakare works for the fresh water protozoan diversity around Wai and captured this Actinosphaerium sp. under the microscope by using a 2 megapixel eyepiece camera at 10x and 45x magnification. 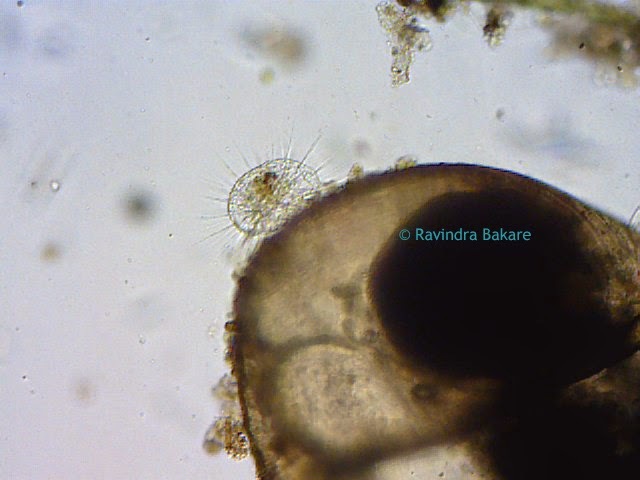 Microscope World is grateful for Ravindra Bakare's work in capturing these images and for sharing them with microscopy enthusiasts!